Cooking is a daily activity done in most homes and on average people spend 2-3 hours in the kitchen every day. Though it is common to find people who eat out, preparing food at home is a necessity if you have a large family or want to save money. In every major city, restaurants can be found on every major street catering to the needs of diners and on the internet, YouTube channels create self-help cooking related videos aimed at providing viewers with cooking techniques. Although food plays an essential role in our daily lives and cooking is a necessary skill for survival, many people still find it difficult to quickly prepare a good meal. 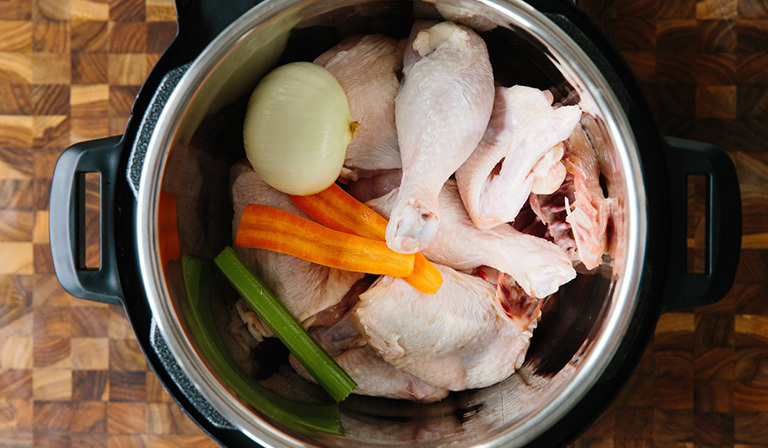 This article aims to show you how to prepare a full course meal using a pressure cooker. Pressure cookers are modern cooking appliances used for preparing meals and are found in many homes. They boil and cook food using the heat of steam. 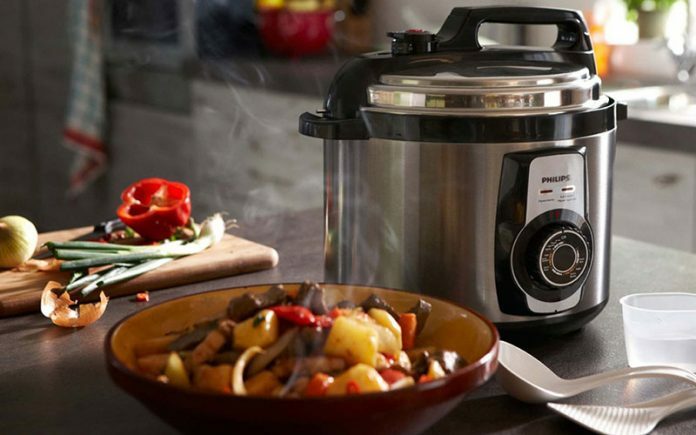 Pressure cookers are easy to use because even though water pressure cannot go above 100 Celsius, steam can and this makes cooking possible in higher temperatures. The pressure in these cookers keeps moisture sealed so there is less risk of burning the food which is common with other cooking appliances. Its ability to trap heat and moisture also makes cooking much faster so you spend half the time in the kitchen than you normally would if using a different appliance. Another good feature is the self-regulatory system of cookers. During the use, you do not have to constantly regulate the heat pressure or constantly stir contents to prevent burning. The control system steps up the heat pressure when needed and steps it down when pressure is too high. Pressure cookers can cook evenly ensuring that your food is properly cooked because the heat produced from the burner is evenly spread. 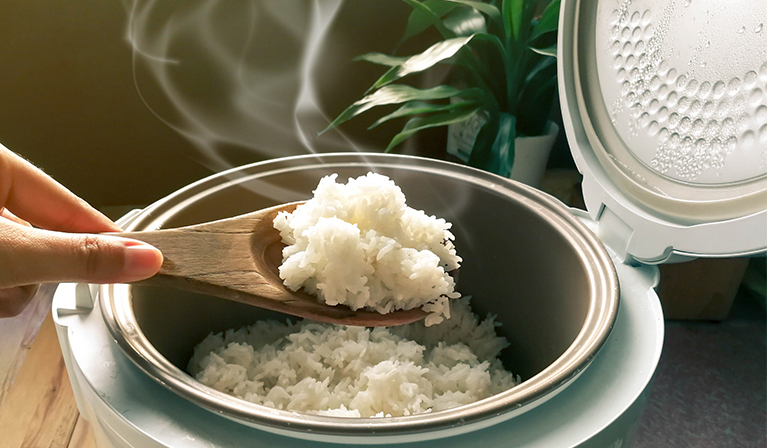 This article will show you how to cook rice in a pressure cooker as an alternative to a rice cooker but before going further, it is important to note the difference between the natural and the rapid release of steam in a pressure cooker. Natural release is essentially meant to keep the Pressure Cooker’s Lid on after cooking while turning off the heat. This ensures that the existing steam trapped in the cooker keeps cooking the contents but at a much slower rate to prevent burning while Rapid Release is meant to release all the pent up steam as soon as cooking is done to avoid cooking the food further after the heat has been turned off. 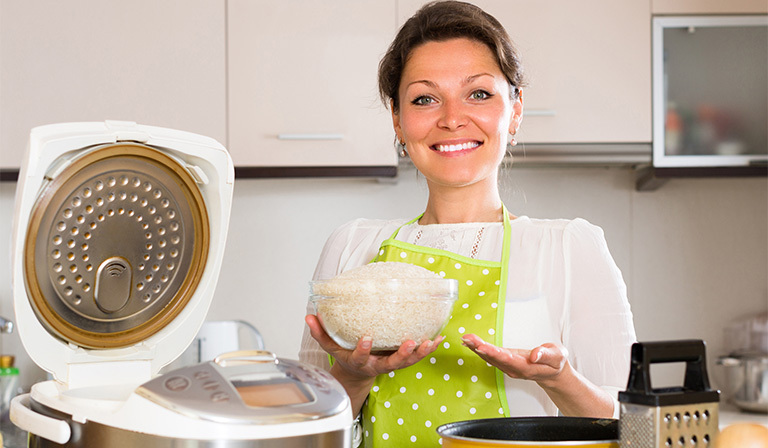 How to Cook Rice in a Pressure Cooker? If you want to cook brown rice in a pressure cooker you must first understand that no cooking method works perfectly when cooking all sorts of rice. What works for one type will not necessarily work for another so attempting the same cooking procedure for all types will not work. 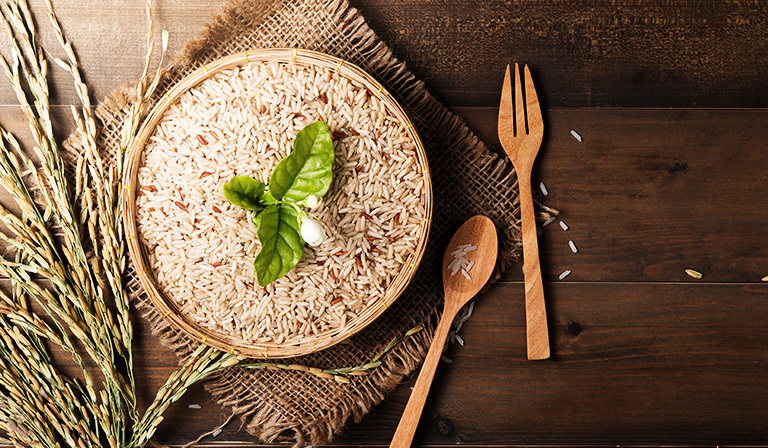 Discussed below are the different procedures for cooking Basmati Rice (for a tasty dinner), Brown Rice (for a healthy dinner), and Jasmine Rice (for Asian dishes). Place 1 cup of rice and 1.5 cups of water into a Pressure cooker. Seal the pot and cook at high heat for 4 minutes. Cooking with high heat ensures that rice grains are evenly cooked. Whether you are using a cooking stove, an induction or an electric Pressure Cooker, high heat is of essence. Make sure to go deep with your spatula and pull it up from the bottom when tossing it. 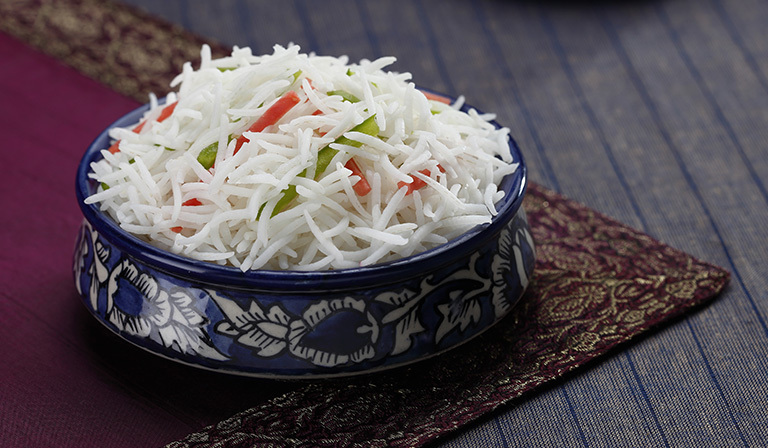 Stirring too frequently will break the Basmati rice grains into smaller pieces. Place 1 cup of rice with 1.25 cups of water into the pressure cooker. Seal and cook for about 22 minutes at high temperatures (Brown rice is hardy). Naturally release steam for 10 minutes. After 10 minutes, force out remaining steam if any is still trapped inside and remove your lid to find the cooked brown rice grains. 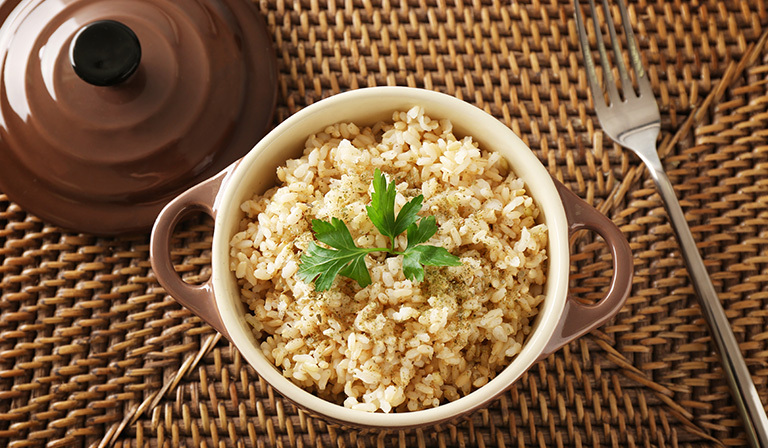 Note that brown rice grains need to be done properly because unlike other rice grains, brown rice grains are hard and take time to soften under intense heat. Seal and cook for exactly 1 minute. (Jasmine grains are very delicate so cooking for much longer would turn the grains into a mushy marsh which is fine if you are looking to make rice pudding or sushi, If not, only cook for a minute. Naturally release steam and let it simmer for 10 minutes. 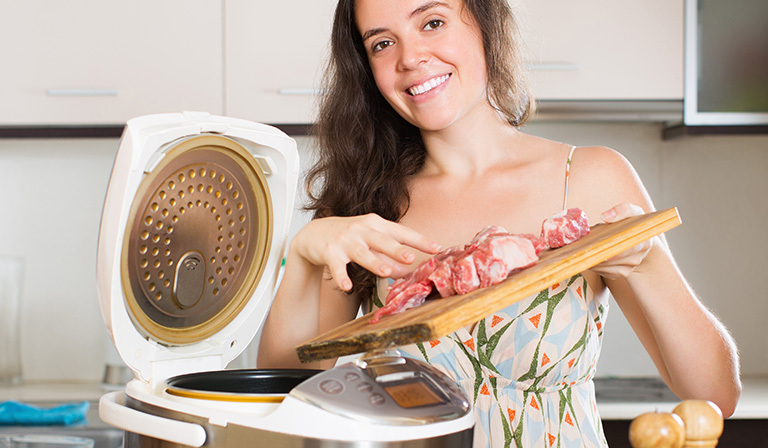 Many people who do not know how long to cook meat in a pressure cooker and so they often end up ruining the beef by overcooking it. There are numerous types of meat not limited to chicken, beef, mutton, venison and pork and each meat type requires different cooking procedures and recipes. Applying the same ingredient and cooking procedures for them all will ruin your cooking and you need to know how to avoid burning food when using your pressure cooker. The list of procedures for cooking the various types of meat is inexhaustible so we will just stick to a general cooking format suitable for all kinds. Place your chicken and water in equal ratios in your Pressure Cooker if you want a mild glaze and a gravy feel. Use twice the amount of water if you want a Broth. Add your ingredient of choice depending on what you are cooking. Cook for 10-12 minutes depending on the content volume. DO NOT go above 12 minutes. After 12 minutes, naturally release steam for 5-8 minutes before bringing out your steaming hot chicken thighs and wings. Place the red meat and water in ratios 5:4 in the pressure cooker. If you want to roast your red meat, cook for between 40-60 minutes depending on the volume. Starting at a high temperature for 5 minutes then bring it down to simmer for the remaining period. For small meat chunks, cook for no less than 15 minutes and no more than 20 minutes. Ensure that you cook using medium meat all through. Once done, naturally release all the way through before removing the lid and bringing out your already cooked meat. When using a Pressure Cooker there are essential safety tips you need to imbibe to avoid injuries or spoiling your food. You need to be safety conscious when using a pressure cooker. Make sure you keep your face away from the cooker before removing the lid. Being too curious might expose your face to the intense heat of the Cooker which can cause face burns. Lightly grease the bottom of the cooker before you commence cooking. This will help you when you bringing out the meat once it’s done or/and if you’ve overcooked it. Take special care when cooking meat. 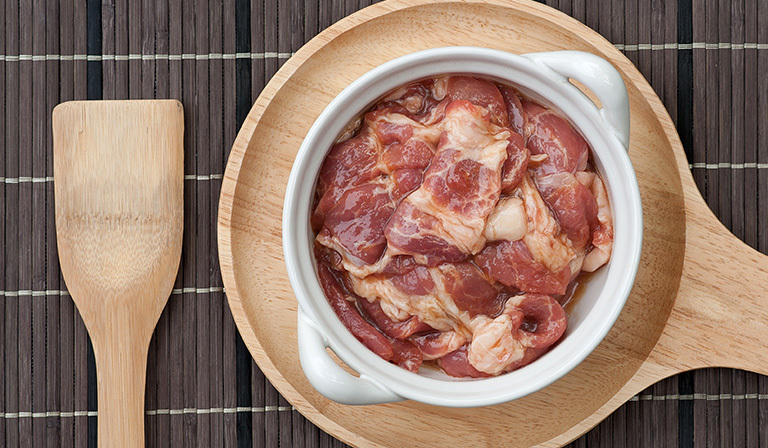 Boiling meat for a long time is unsuitable if you want your meat to taste nice. The required output will largely depend on the type of meat you are cooking. Although aged meat is better when you roast it on a grill than in pressure cookers but if the meat is too dry, add some more water to avoid searing. If you are using an Induction or an electric Pressure Cooker, you get an even heating temperature when placed on a high or medium level but gas stoves have two high and medium burners. Do not forget to examine the heat temperature of the stove before adjusting to a high temperature. Using a pressure cooker is relatively easy if you know how to use it. For those who do not know how to cook rice in a pressure cooker, the tips provided in this article can be helpful. Following these steps will save you a lot of time and effort. The even temperature produced by your pressure cooker ensures that brown rice is properly cooked so you need not worry about ruining your food. Always take note of safety precautions when using one to use it safely and avoid injury. Also, endeavor to examine temperature levels before adjusting the heat regulator. Pressure cookers are efficient kitchen appliances for cooking red meat, braise, chicken thighs and different types of rice. They are not only cheap but are also easy to use.